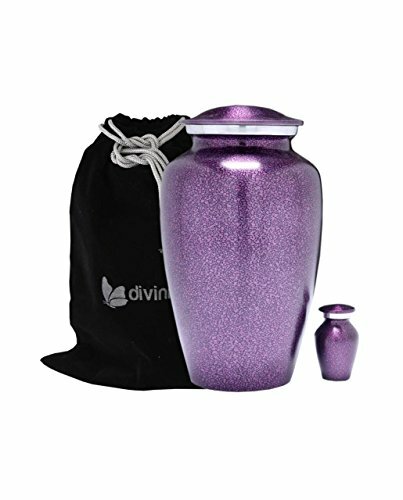 Divinityurn's Classic Purple droplet is elegant and affordable CREMATION URN . The urn is made from solid metal and the perfect lacquer coat to preserve its brilliance. It comes with top opening with a threaded lid and felt bottom. The purple finish is uniquely finished by hand for each urn to show beautiful detail giving the FUNERAL URN a unique look to each finished product. Our urns are handcrafted uniquely by an ancient process called sand casting. This ADULT URN holds up to 210 cubic inch of cremains and approximate measure is that 1-pound weight prior to cremation equals 1 cubic inch after cremation . Dimensions: 10-inch-high x 8-inch diameter. All of our urns are in our warehouse and ready to ship as soon as payment is cleared. Usually we ship within one business day of receipt of payment. If you have any questions about this product by Divinityurns, contact us by completing and submitting the form below. If you are looking for a specif part number, please include it with your message.